My first experience of a virtual world was about eight years ago, when a friend lent me Riven to try. I was transfixed by the game, which involved travelling around a strange and beautiful place, as an invisible traveller. 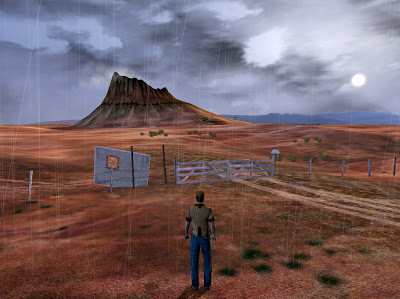 This photorealistic world had remarkably few people - just a handful glimpsed here and there, in video sequences that merged seamlessly with the game. It was one of the defining aspects of the game that the explorer played him or herself in this strange world, and that was the reason for the invisibility of the explorer. Everything one experienced in the game was experienced in the first person, as though you were seeing it through your own eyes. 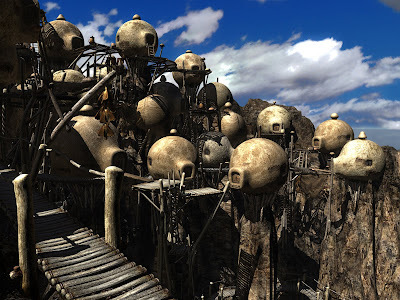 Riven was a point-and-click adventure, which meant that one clicked in the direction that you wanted to go, and the scene changed as you moved in that direction. There were some linking scenes of film which gave the impression of travelling around in a vehicle, and I spent quite a lot of my first couple of days in Riven travelling between islands for the thrill of the ride in the little cable car which linked them. Riven introduced me to a lot of the skills which I have found so useful in the subsequent years. "Mousing over" a scene to find places where things could interact, collecting information while travelling around, exploring thoroughly for every clue. I found Riven to be beautiful, engaging and challenging, and it took me roughly three weeks to solve it, in which time I found it difficult to do anything else. I kept journals of exploration, noting the things I found, and I was seized with the desire to make games of my own - not to play more games but to create them, although I didn't really believe that this would ever be possible. I visited the world often, simply to travel around and see favourite places or to listen to the haunting music which Ryan Miller wrote for Riven. I dreamed about it as though it were a real place, and even felt homesick for it. It's hard to explain to anyone who hasn't played such a game, how immersive it can be. Watching someone else play a game like that isn't at all the same as sitting in front of the screen yourself. There is some magical change which overcomes one and enables the player to become something other, to believe that you are inside the world. I had played other computer games... very early on, in the 1970s, we had a games console which had to be linked up to the tv, to play pong, a crude video approximation of tennis which involved a square ball and a couple of straight lines for bats. This was swiftly followed by space invaders, and similar shoot and destroy types of game, chess, and all sorts of text-based Adventure games. When my company introduced Wang word processors for a short time in 1980, I had become a Master at Wang adventure game, which involved giving directions like "go west" or "turn left" and learning the layout of a cavern and where the dangers and rewards lay. Computer games of the first person shooter type were still pretty crude at this point, and didn't really interest me. By comparison, Riven, being based in what appeared to be a real world, with segments of film seen from a first-person perspective, appeared to be very sophisticated. I'd been online for about five years at this point, and so it was natural that I should surf to the Cyan Worlds home page and discover that Cyan were in the process of creating a new game, which was to be played online, codenamed "MudPie". I signed up to participate in the beta, without the slightest idea that I might be chosen. Just long enough later for me to have forgotten that I had signed up, I received an email to tell me I had been chosen to take part in a closed beta test. Shortly after that, when I had signed up at a forum and sent in my non-disclosure agreement, I found myself loading the new game. Fortunately for me, I had switched from my PowerPC Apple Macintosh to a PC, as Uru as it was called, was not available at that time for the Macintosh. I still think this was a big mistake on the part of Cyan, although I am sure they had their reasons. The Apple community had been a big part of the fan base for Myst and Riven, and so making it impossible for them to play the latest game in the Myst and Riven sequence prevented the largest part of their market from participating. I have to admit that initially I was disappointed by Uru. Not by the game, or the world, exactly, but how cartoony and unreal it seemed after the photoreality of Riven. There were other differences. The explorer was now represented by an avatar on the screen. There was an opportunity to customise the avatar, add weight, change the colour of her hair, add a cap or travel in sandals or put on a fleecy top. But actually there were very few choices about the face or physical appearance of one's avatar. This frustration was increased when I started to play the game, as early on in the initial section of the game I clicked a sequence of buttons to be startled by the sudden appearance of a figure of a girl who is one of the recurring narrators for the storyline. She wasn't wearing the standard issue clothing, and appeared to have both jewellery and a scarf wrapped around her hips as a skirt. I wanted her clothing, her level of customisation. After a short while blundering around in the preface to the game, I made it through to my Relto, the island which is each player's base in Uru, and the launching pad for all other areas of the game. Much like the avatar, each island starts off looking the same, but small changes are wrought to the island as one collects items from other places. One relto looks very like another, though, except for the number of books on the shelves, or the addition of a tree or sticks and stones to the island's surface. From this island, it was possible to reach the neighbourhood, an enclosed town where it was possible to meet other people. I didn't, although I followed the instructions to collect my ki, a communicator that made talking to other people possible, and from there it was possible to teleport to the city in the cavern. It was here that I first made contact with another player - and promptly ran away.